As a reviewer, I’ll be honest about my biases; I am an art historian in training, I am a sucker for themes of the occult and secret societies, I am obsessed with murder mysteries, and I will pick a story-based game over an action-heavy game every time. That all being said, I will also shamelessly confess that I did not even finish watching the trailer for The Council before my mouse was on the “purchase” button. Released March 13th, The Council is a new Narrative Adventure game developed by Big Bad Wolf and published by Focus Home Interactive. 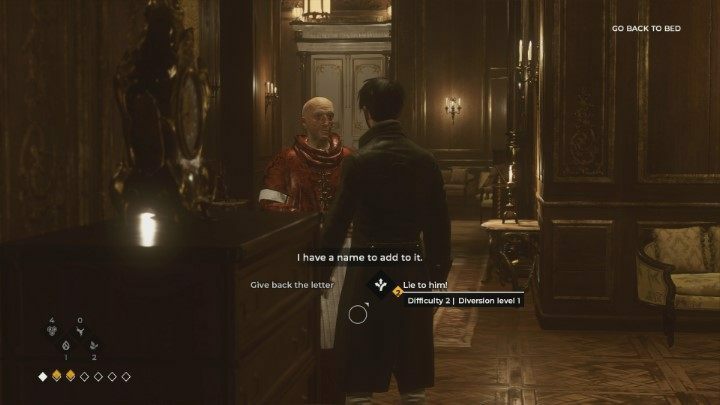 Set in 1793, you play as Louis de Richet, a young Frenchman searching for your missing mother, Sara, who happens to be an expert in matters of the occult and the leader of the French sect of the Golden Order (a prestigious and mysterious secret society.) She disappeared on the private island of the eccentric and evasive Lord Mortimer. He has invited you to his island to help search for your mother at the same time that he has invited members of the upper crust to meet and discuss their plans for the world. Among these guests are fictional as well as historical diplomats, (some suspension of disbelief is required, but that is part of what makes the game so fun) whom you can mingle and conspire with- but be warned; no one is to be trusted. Isolated on an island where the clues of your mother’s whereabouts become more and more bizarre, you find yourself surrounded by schemers, each with their own goals, and each with their own potential services in solving the mystery unfolding before you. The storyline is intriguing and complicated with twists and turns that leave you on edge. In addition to a rich storyline, the environments in this game are beautifully designed and every scene is a visual feast for the eyes. Seriously, this game is gorgeous. You cannot save the game. There is no “hmm… I think I could have done that better, let me open my last save and fix that.” Any mistake or choice you make in the game you must adapt to. This brilliant (albeit occasionally frustrating) mechanic raises the stakes and puts the pressure on the player to really make the “right” choices. Failure to do so will change the clues you are able to find and the resources you can access, meaning there are multiple endings per episode and multiple endings for the game as a whole. I could go on and on about this game so before I sound like a paid company lackey, let’s talk about some of the drawbacks. First, this game is not for people who want fighting or “action” out of their games, though there are elements that require quick reflexes. You frequently get the chance to “observe” traits in other characters when the scene freezes and you quickly have to pick out an important detail. For me, this lack of fighting and button mashing is a major plus, but it certainly is not everyone’s cup of proverbial tea. While I am not bothered by the gameplay, the script and voice acting are sometimes distracting from the mood of the game. Modern phrases and casual slang are often disruptive of the grim and historical setting. This is, of course, me being a nit-picky history buff, but it has given me pause every time George Washington says something like “seriously though…” The voice acting behind Louis is occasionally strange; as if someone has gotten the words and pronunciation correct but not always the tone. He simply falls flat at times and at other times seems too unphased by the seriousness of a situation. It also bugs me that despite the frequent references to him being French, he does not have the slightest hint of a French accent yet Napoléon and the servants do have French accents. The rest of cast, however, have dynamic voices and appropriate accents.